Go to original pattern for design DROPS 97-9. 100-100-100-100 g colour no 21, jeans blue. 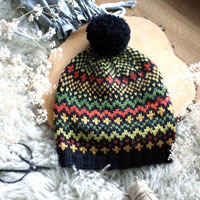 DROPS double pointed needles and circular needle (40, 60 and 80 cm) size 7 mm - or the size needed to obtain the correct knitting tension. DROPS crochet hook size 7 (for the edges). 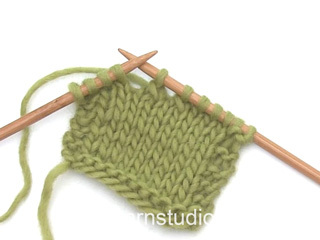 Knitting Tension: 11 sts x 17 rounds on needles size 7 mm in Highlander and stocking sts = 10x10 cm. Increasing tips: Inc. 1 st at the right side of the marking threads on every other round until finished. Inc. 1 st as follows: make a yo, on the following round twist and K the yo. 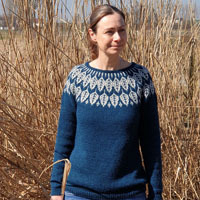 Back and front piece: The cardigan is knitted in a circle from the centre of the back piece. 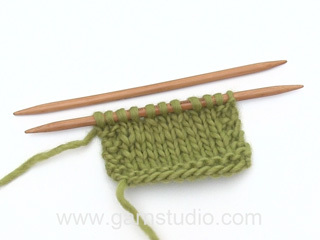 Cast on 7 sts on double pointed needles size 7 mm in Highlander. K 1 round. Then K 1 round and at the same time inc 1 st in every st = 14 sts. Insert 7 marking threads in the piece with 2 sts in between. Continue in stocking sts at the same time inc on every other round – read increasing tips – change to longer circular needle as the work proceeds. When the piece measures 25-27-30-33 cm from the centre (42-46-50-56 rounds and 154-168-182-203 sts), mark the armholes as follows: Knit the first 20-22-24-26 sts on round with another colour (this colour is removed later and the sleeve is knitted from here and downwards). 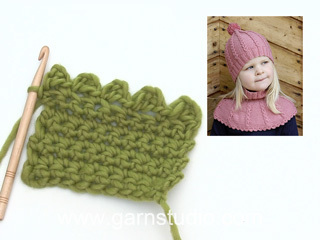 Knit another 44-48-52-56 sts and then knit the following 20-22-24-26 sts in another colour (= the other armhole). Continue in Highlander and stocking sts over all sts and inc as before. When the piece measures approx. 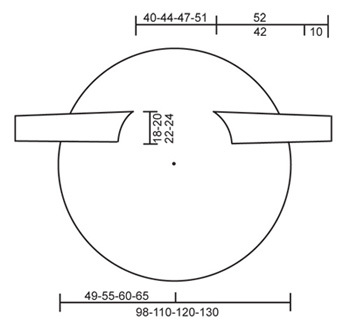 49-55-60-65 cm from the centre and outwards (= 98-110-120-130 cm in diameter) and approx 301-336-364-392 sts on round cast off loosely – NB: To make sure the casting off edge doesn’t become too tight make a yo approx. after every 8th st whilst casting off (cast off the yo’s as sts). Sleeve: The sleeves are picked up on each side of the thread which was knitted in another colour and they are knitted downwards. Use 2 needles, pull the thread out as the work proceeds and put the sts from each side of the thread on separate needles = 20-22-24-26 sts each side. Put all sts on to a short circular needle = 40-44-48-52 sts. Pick up 3 extra sts at the top of the sleeve – the top is where the sleeves are closest to each other- and 1 extra st at the bottom (mid under arm) of the sleeve = 44-48-52-56 sts. 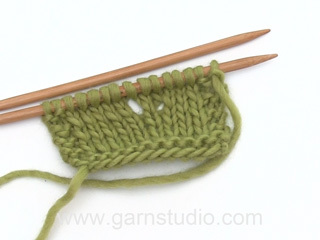 Begin to knit the sleeve from mid under arm – insert a marking thread. Knit in stocking sts. When the sleeve measures 2-2-2-3 cm dec 1 st each side of the marking thread, repeat the decreases for every 5-4.5-4-3.5 cm 8-9-10-11 times = 26-28-30-32 sts left. When the sleeve measures 51 cm P 1 row from the WS and cast off loosely, the sleeve measures approx. 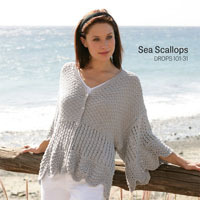 52 cm- NB: Try the cardigan on before casting off to make sure the length fits. Crochet edge: Crochet an edge around the whole cardigan and at the bottom of the sleeves on hook size 7 in Eskimo as follows: 1 dc in the first st, *4 ch, 1 tr in the first of the 4 ch, skip approx 4 cm 1 dc in the following st*, repeat from *-* and finish with a sl st in the 1st dc from beginning of round – NB: Make sure the crochet edge becomes even and neat, and not “wavy”. Me podrian enviar el Patron para realizar este hermoso saco. Gracias. Ich möchte unbedingt die Anleitung bitte haben. Danke. Jos tämä neulotaan siis ympyränä niin laitetaanko 7 aloitussilmukkaa jo rinkiin sukkapuikkojen kanssa? Ja miten?Onko aina 2 silmukkaa/puikko ja 4.llä puikolla vain yksi?Osaako joku auttaa? RIGTIG FLOT DEN VIL JEG GERNE EJE.